🎹 UPDATED REVIEW - April 1, 2019 - RECOMMENDED - Casio PX780 Privia cabinet Digital Piano - A BEST BUY - This piano continues to be a big hit for the Casio company since it came out and it offers many upgraded features under $1000 that other digital pianos do not have. The Casio PX780 ($899US internet discount price) has a fairly realistic graded hammer style piano key action that feels very nice in its price range along with a clear acoustic piano sound quality and a large compliment of useful educational and fun features all together in a contemporary compact furniture style cabinet with sliding key cover. There are many great piano brands which produce some fine digital pianos in a variety of price ranges including Yamaha, Kawai, Roland, Casio, Kurzweil, Korg, and others. Normally, furniture cabinet digital pianos with lots of useful features that play & sound good are rare to find under $1000 so the Casio PX780 is a great choice in its price range based on my playing experience with it. 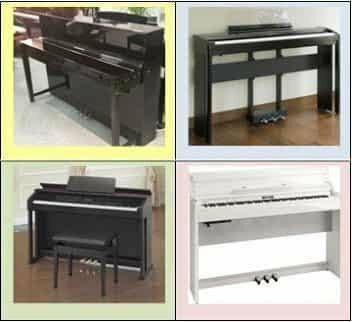 Of the major brands, Casio is the only company with a furniture cabinet style digital piano in this lower price range that offers what it does and is available on the internet for purchase. You would have to go up to the Yamaha YDPV240 digital piano to get something that would get closer to the Casio PX780 and that Yamaha piano really doesn't come close in a number of ways with regard to functions, sound, and key action. It does have a nice looking cabinet and overall sounds good, but the Yamaha YDP240 has a discount selling price of $1999 in piano stores and on-line which is more than double the price of the Casio PX780. Although Yamaha makes some outstanding instruments (and I personally own some Yamaha product), in my opinion this Yamaha cabinet piano is vastly overpriced for what it does and the Casio is seriously under-priced for what it does in comparison. I am not advocating that Casio is the best digital piano company out there because there are other good brands such as Kawai, Yamaha, & Roland who make even better digital pianos in much higher price ranges. However, in the lower price range for under $1000, the PX780 piano is pretty amazing and its price is affordable for most families. 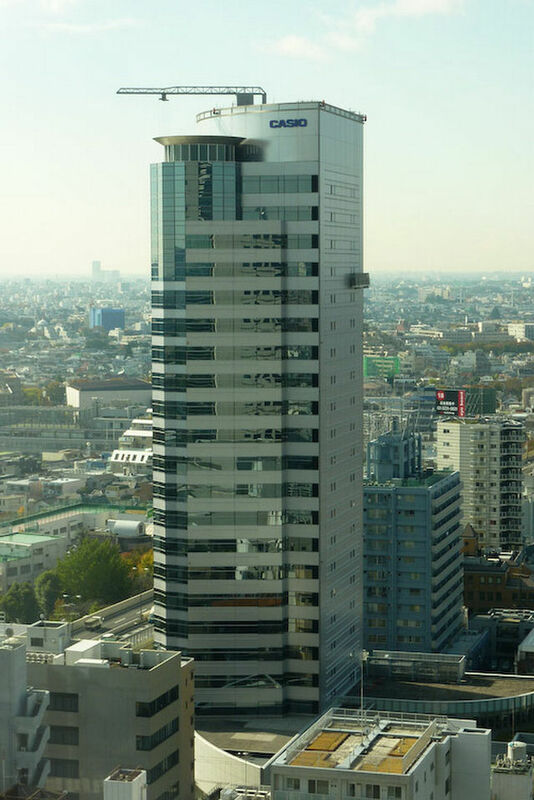 The Casio company has its worldwide headquarters in Tokyo, Japan (left pic) and has been producing digital pianos for over 30 years. They also produce keyboards, pro synthesizers, as well as being famous for calculators, advanced digital cameras, sports & consumer watches, advanced digital technology for communication devices, and some very impressive new digital computer technology. Casio produces their own computer chips and proprietary micro technology and is able to do it at a fraction of the cost of some of it's biggest competitors. That is why Casio tends to have lower prices. Some people equate lower prices with lower quality but in my opinion these new Casio digital pianos are quite impressive. Beyond that, Casio has a new 3-year parts & labor warranty (with on-line registration) which shows they are serious about giving consumers product protection and have confidence in their new pianos. 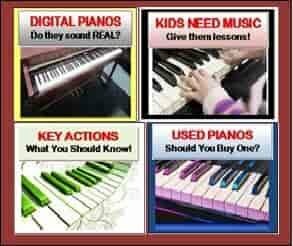 Many warranties on digital pianos under $1000 have no more more than 1-year labor or maybe 2 at the most, so 3 years is outstanding in my opinion. 3-sensor (Casio calls it Tri-Sensor) dynamic response key action (above left pic) for more piano sound range and expression (Yamaha does not have this on their Arius series under $2000 although they do have it on their Clavinova series over $2000). 3-key sensors per key make a big difference in "musical color" of sound and your ability to express your music. If you want further info on this, please ask me. A fairly quiet key-bed with little noise as the keys are pressed down as compared to other brands in the same price range. New synthetic textured Ivory & Ebony key tops for smooth finger movement. 128-note polyphony with piano resonance & longer piano sustain decay times to produce noticeably more realistic piano sound along with enough polyphony for sound layering and using accompaniment & MIDI recording features. Big piano sound through a 4-speaker 40 watt (total) stereo sound system. 3-pedal soft/sostenuto/sustain pedal system with "half pedal" sustain function for proper pedaling response. USB class compliant core MIDI high speed direct connection to iPad or laptop computer to utilize some outstanding piano education & notation apps now available for tablets. 360 drum rhythm patterns for timing and rhythm training (most digital pianos under $2500 offer 0 up to100 rhythm patterns depending on model). 250 nice instruments for use with song creation, arranging, composing, and playing just for fun (most digital pianos under $2000 offer approx 10-25 instrument. wav file audio recording so you can make live recordings of your playing (useful in converting to MP3 files for MP3 players or to attach to emails for sending to friends and relatives). Plugging a microphone into the piano to record live vocals while you're singing & playing at the same time or separately and then saving it all to a USB flashdrive in a .wav audio file! Arranger style chord system with 360 music styles for full accompaniment on your left hand. This allows for integration of a live band or orchestral backup while playing "chord style" using a variety of music accompaniments in the piano including Jazz, Classical, Latin, Country, Rock, Oldies, Waltz, Big Band, Blues, Folk, Contemporary, World Music from other countries, and many other music genres. This feature helps with allowing you to integrate rhythmic music styles into your playing to make your playing music even more enjoyable. 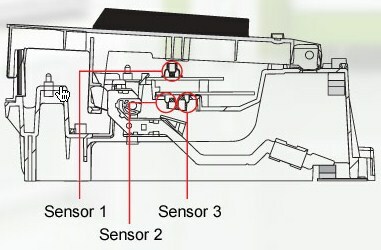 LCD user display screen directly in front of you for easy to read control panel information. 86 "Jam Session" chord progression loops for learning song improv. This unique feature allows the player to learn how to "jam and improvise" with built in chord progressions with 86 recognizable "song loops" that make learning to play "by ear" fun and enjoyable. Ear training is a great way to play piano and helps with understanding music. Layering & splitting any two sounds anywhere on the keyboard. Duet "4-hand play" for two people playing on the piano simultaneously. Grand piano "stretch tuning" function to give a more realistic grand piano sound based on the way piano tuners tune grand pianos. Transpose and modulate to any key up & down half-steps while playing the piano. Variable reverb, brightness, key sensitivity, octave shift, song & accompaniment volume. Panel control button lock to protect your settings for inadvertent button pressing along with auto power shut off function. Connectivity: Stereo 1/4" audio outputs, stereo audio inputs to run your iPad or computer volume back through the piano, MIDI in & out ports to connect with MIDI sound modules, other keyboards, and other MIDI devices, Dual 1/4" headphone jacks. Yamaha, Roland, Kawai, Kurzweil, and other brands have some fine pianos as I've mentioned earlier, but for the internet selling price of $899, it hard to argue with the Casio PX780. I will say that one of the advantages of some of the more expensive pianos near or over $3000 is their more powerful internal speaker-audio systems and nicer furniture cabinets. But for many families the PX780 speaker system and compact furniture cabinet is a perfect choice in a price range like this and compared to some of the other brands, it actually offers more in terms of sound output and functional cabinetry. The piano can fit in smaller spaces, has a protective key cover, and is fairly lightweight. I have seen some more attractive pianos in or near this price range in terms of cabinet design and color offerings, but once you get "under the hood," then the piano key action, sound, and pedaling can be a big disappointment. So don't be fooled by the outside of the piano as to what you think the inside might be like. You need to judge those things independently of each other so that you get the most for your money in terms of a good musical instrument. The PX780 has built in stereo audio outputs and inputs (left pic and also showing USB device in & computer out) so you can easily connect a small external speaker system to the PX780 for an even fuller if you feel that's necessary. In fact I have personally played this piano through its 40 watt, 4 speaker internal speaker system and the results are very good without any external speakers connected. If you use a good pair of headphones for private practice, then the sound is equally as good that way and it stays right in your head without anybody else hearing it...which depending on how you play, may be a good thing:) So when you boil it all down and look at what the Casio PX780 has to offer as compared to other pianos for the same price on up to over twice its price, this new Casio piano is definitely offers a lot of bang for the buck. By the way, if you choose not to use all the extra on-board features and if you just play the piano sound by itself, you have a selection of 10 different acoustic piano sounds and can play any kind of music with them such as classical, jazz, rock, church, etc. So just playing traditional piano on the PX780 is quite enjoyable and if that's all it did it would still be a great buy compared to other brands & models in this price range based on my experience with it. 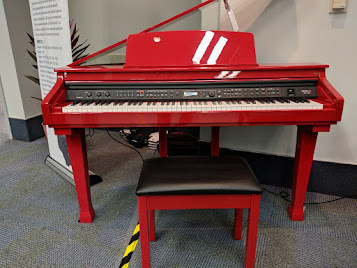 It's my belief that just because a digital piano has many built-n features and buttons on the piano does not mean the piano cannot stand on its own as an instrument for people who mainly want to play piano. In its price range it really does a good job in that way and then perhaps later you can use some of the extra features that can make your music even more enjoyable than it already is. As far as any drawbacks or downsides to the PX780, the only ones I can see is the cabinet itself in that some people may want a cabinet that looks even more like a piano such as the new Casio PX870 ($999US internet price), the Casio AP470 ($1499US internet price) or other brands in a higher price range (as I mentioned earlier). Also, the PX780 does not normally come with a bench like some other piano brands do. However, good piano benches are relatively inexpensive and easily purchased on the internet or at local stores and I can give you recommendations on those benches too. As the old saying goes, you don't get something for nothing, but for $899US internet discount price, it's hard to complain, and the cabinet itself is fairly sturdy and stable for most floor situations and actually looks pretty good in its price range. It competes extremely well with the higher priced Roland F140R ($1199US internet price), Roland RP501R ($1499US internet price), Yamaha YDP144 ($1099US internet price), and Yamaha YDP164 ($1499US internet price). 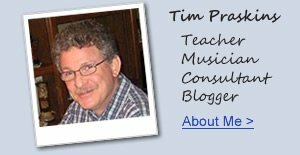 If you want more info on new digital pianos and lower prices than internet, Amazon, Bundles, and store discounts, please email me at tim@azpianowholesale.com or call direct at 602-571-1864. Could you please Casio PX780 compare with PX850? Thanks! thanks so much for the effort you have put into reviews of digital pianos. I think I will wait for the PX780 based on all that I have read. How do I get on a waiting list? They are completely different pianos for different musical goals. You can read my blog reviews about them more closely or email me direct for additional info. I can't decide between the Privia 780 and the 850. Which one is better? Do they have the same action? Do they sound the same? Which one doesn't make thumping noise (or more quiet) when you press the keys? If the 780 is newer and better, why does it cost less than the 850? What are the differences? Please help me decide. Thank you. Hi. I'm having trouble finding the exact parts of your reviews that compare the PX780 to the PX850. Can you show us where they are? Great article with good information. I'm choosing between this PX-780, as I have not seen available yet, and the more expensive Kawai ES7. Does the ES7 has both better piano sound and more realistic key feel? If i were to choose a digital piano between the YDP162, PX850 and PX780, which would you recommend? also i'm looking for the realism of an acoustic piano(weighted keys and the sound of a piano/grandpiano), extra sounds and features are just a fun plus. I really appreciate your piano reviews. Thank you so much. I also appreciate all the information you share. Am wondering if the PX780 Voices include the Koto or Asian sounding instruments. But am going to call you. Thanks again! how would you compare the kawai mp6 ad the px780 ? Is there anything else different between them? I don't see any information on a 3 year warranty for the PX-780? Even on Casio's US website I can only find a 2 year extended warranty for registering online. I do see a 3 year for the European .uk site but is it for sure available for US customers? Which of Casio new digial piano's would you recommend if I plan on using PianoTeq to supply sound? Right now I am looking at the PX150, PX350 and PX780. If they are all the same in terms of the realism of an acoustic piano, then I would go with the cheapest one. Identical key actions but the PX150 does not have audio outputs or audio inputs and that can be an important feature for many people. Also the 150 does not have LCD display so it can be more difficult to know what functions you are using and how to activate them on that model. How would you compare the Casio PX750 to the PX780? Can you comment more on the specific speaker systems that would sound better for $200 - $400. Thanks! My daughter (13 year old) has been taking piano classes - and has outgrown the touch sensitive 61 Key model (Yamaha). Based on your reviews, it appears our choice is between Casio PX-780 and PX-850. Please advise as to which one would be a better choice. Hi Tim - thank you so much for the incredible effort you put into this. It's 40th Birthday time for my wife and she's returning to piano playing after many years away. If it were you, would you have a preference? Before your excellent site, I thought we were looking for a Roland (e.g. 507) until I found out the price differences! Key action - much better than the Yamaha, Korg, and Kawai models I tried while shopping around. I can still tell it's not a real piano, but it's close enough for me, and I've played for 9 or 10 years! Sound quality - It's good enough that I can pretend I'm playing for an audience in a church. I'd say a concert hall, but I've never done that in real life. The high notes are a bit shrill for my liking, but I'm still getting to know the different piano sounds that are programmed in, so this may only be temporary till I find the one I like. It actually came with the sheet music for the songs that are programmed in. Don't know if I just missed it in the description, but I was pleasantly surprised by this! Good instructions and easy assembly. It's meant for two people, but I managed it on my own. Lots of digital extras - I haven't explored these very much just yet, but I know it's probably smarter than me, and can do lots of cool stuff as Tim describes. Volume - it's quieter than I expected. To really "fill the room" I have to turn it all the way up and still play what feels like forte on an acoustic. Touch sensitivity - It's great until I get to what I would call fortissimo on an acoustic. Somewhere around there, it seems to get disproportionately louder for the increase in pressure. I don't play there very much, but it does tend to be in climatic sections of songs, so it's a bit frustrating. I believe the touch sensitivity is adjustable, but I haven't explored that yet. Music stand - it's just a bit too short for bigger sheets, but I'm sure I can rig a DIY solution to that. Overall, the pros far outweigh the cons, at least in my opinion. I was astounded at the quality of piano I got for under $1000 and have been playing it every chance I get since it arrived. Also, Tim was extremely helpful in the process. He answered every question honestly and correctly. Every fact and price that I checked elsewhere was exactly what he told me. So if you haven't already, send him an email! Thank you for your very helpful information. It is just what I needed in my search for a good, decently-priced piano. This above concerns me. I am in the market for a Casio Privia PX150. However if the 750 is an upgrade in speakers over the 150, and the 780 over the 750...with the statement above I wonder how weak the 150 speakers would be? 40 watt speaker systems can fill up a room but all speaker systems and their performance definitely depends on the acoustics and size of the room as well as your ability to hear well or not. That situation is going to be different for different rooms, homes, piano placement, and individual people. Many people consider the PX780 & PX750 more than loud enough and never play it at full volume so it just depends who you are. The nice thing is that you can connect an external speaker system or inexpensive monitors to boost volume and fullness if you want to do that. I have never touched a piano in my life and wanted to buy it once, but it good. I've narrowed it down to px350 full package or the px780. Which should I get? There are different reasons to get either one so please email me directly and I will explain. How does the white key surface texture look like for this model PX780? Is it smooth like any other brand (Yamaha, Kawai, etc...) or does it have multiple wavy lines which I guess are called "synthetic ivory keytop"? Thanks. I just want to say "Thank You" for your wonderful insights. I've been researching digital pianos to replace my old Casio CPS-85. After much deliberation (and going by what you've written), I chose the PX-780 and I am so happy with it. It's got plenty of power (for me, at least) and it is a lot of fun. I attached my old 60 watts subwoofer and it now sounds even grander. The PX780 does have a General MIDI 16-track multi instrument MIDI recorder built-in. You can also call it a sequencer but actual full function sequencers can do more.The PX850 has only two tracks and is not general midi. Thanks for the clarification. I have read your reviews and believe I have started to narrow my choices. Like most acoustic piano players I want realistic action/sound, but I also own a Korg O1W-pro and want the flexibility of multiple sounds and the creativeness that this allows. You seem to favor the Casio for the action & sound- so I'm comparing the differences between the PX-350 and the PX-780. My primary usage will be in my own home, though may take it out, like to church. With this said, are there any major advantages to the 780,knowing its not as portable as the 350, that would sway me to go with the 780 over the 350? Hi Tim, So i'm wating to buy the casio PX780 and I'm going to buy it off of amazon, does it always come with a key-cover-lid? It's really important in my house. The Casio PX780 does have the built-in sliding key cover. I have a picture of that on my blog review if you take a look. With regard to buying it on Amazon, I have some info for you on how to buy that model brand new with free shipping and no tax for less money than Amazon. You may email me directly if you are interested in more info. Thanks for all the help you provided last fall when I purchased the Casio Privia PX-780. It is everything I need to get back to playing after a 25 year absence. I am enjoying it and am slowly getting my technique back. Thanks again for the great service you provide! Thanks for your amazingly helpful and thorough reviews! 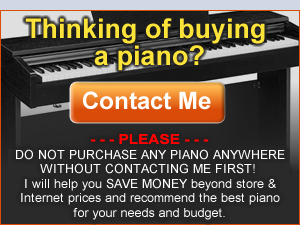 You made the process of selecting the best digital piano for me so much easier! Keep up the great work! Thanks for the review. How do you think the PX-350/PX-780 compare to the twice as expensive Roland FP80? Is the FP80 worth the extra money? I'm thinking about getting one PX-350 and one Roland FA-06 instead of the FP80. I hope getting a lot of fun with thousands of sounds and features and still a good piano key action. Your review says that you can use a microphone on PX780 and then get both your piano playing and voice recorded into a .wav file. I have read the manual and cannot find how to do that. Could you please explain? Plug the mic into the audio input and then use your audio wav file recorder to record any vocals or live playing onto a USB flash drive.. The flash drive must be formatted first in the piano. Bought this piano from Tim based solely on his recommendation here. I've had it for 18 months and absolutely love it for self-teaching. Been to the Guitar Center to try out similar priced pianos-double the price. This is indeed a very good feel and sound and great value. Professional musician with a 35k Kawai grand at home came over to check it out and said it has a very nice feel. Our small house with family of 4 could never deal with a "real" piano. This is definitely the next best thing with headphone jacks, great sound and great feel. Thanks Tim! Excuse me, Sir Tim. I'm thinking of buying a digital piano and the only two available Casio decent keyboards in my area is the PX-760 and AP-250. They have the same price range, more or less. What are their differences? and which one would be most likely the better choice? Do you recommend the PX-780 over the CGP-700?